Airfreight rates remained resilient through Chinese New Year, with Drewry’s East-West Airfreight Price Index reporting its lowest-ever monthly margin decline in January. Rates fell just 0.13 cents in the month – compared with 24 cents in 2016 and 29 cents in 2015 – to hold above the $3 mark, at $3.01, and 32 cents ahead of where they were in January 2016. 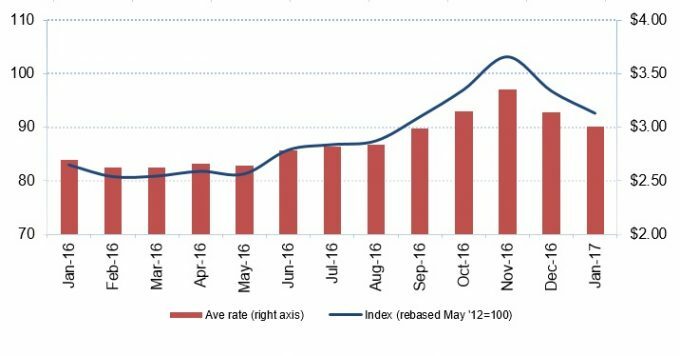 Drewry Sea & Air Shipper Insight says the limited fall indicates improving stability in the market, despite the rate itself being the second-lowest on record for January – January 2016 was $2.69. While January proved positive, Drewry said it expected a small seasonal decline this month, reflecting rates quoted on the latest TAC Index on 6 February. TAC quoted Hong Kong-US rates at $3.21, compared with $3.24 in January. Hong Kong-Europe rates fell 33 cents between January and February to $2.13 compared with $2.46 a month earlier. Neither WorldACD nor IATA have published their January figures yet.